It took a full 10 minutes before I read the message that flitted across my phone’s screen, pinging for my attention from across the room. My most eloquent response: Woah! Where are you? I dropped everything I was doing, threw on some clothes, and ran out the door. I had to experience this for myself! The talent behind the brand name is none other than Amanda Glover, a Culinary Institute of America-trained pastry chef who decided in 2014 that it was her “mission … to bring the pleasure of lovingly prepared baked goods to the community.” Thank goodness for that! 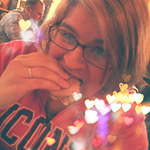 AmandaBakes may not be a household name…yet…but she will be. 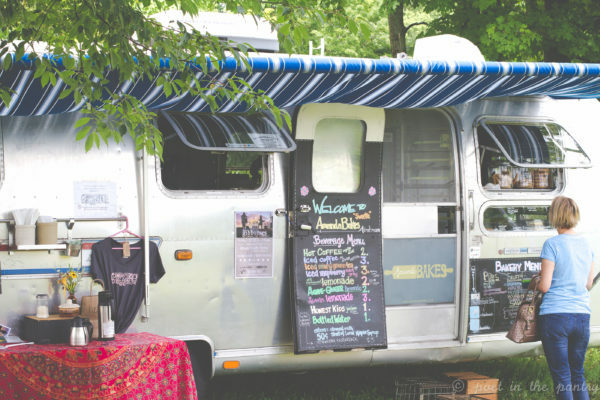 And she can be, too, since she operates out of a converted Airstream trailer, ready to come to your event (or house) to provide party-goers with a selection of the most delightful baked goods, both savory and sweet. I found her trailer–SWEETIE–parked at South Farms in Morris, Connecticut on Sunday, participating in The Morris Marketplace, a farmers market held on the South Farms grounds every Sunday, 11 AM-2 PM, June through October. Her site with a view was the perfect setting for a sampling of the extensive menu. Since my friend, Keith Paul of The Desultory Theatre Club, already provided me with a sneak peek at what he tasted–Bourbon Vanilla Cheesecake with Raspberry Earl Grey Iced Tea, followed by Bourbon Chicken and Leek Pie with Agave Ginger Lemonade–I had a pretty good idea of the variety available. I took my place in line, frantically trying to settle on one treat. 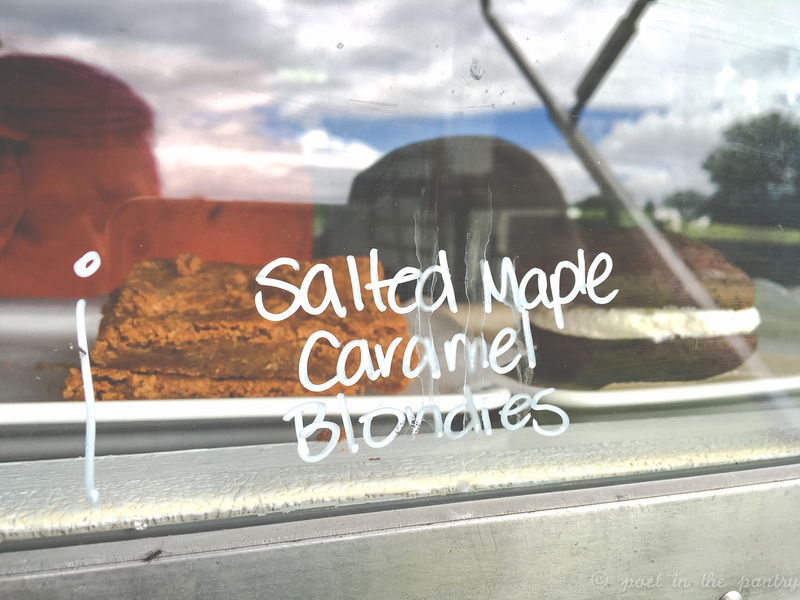 And then, flustered when it was my turn, I ordered two–a Salted Maple Caramel Blondie paired with a Guinness Brownie–with an Agave Ginger Lemonade to wash it all down. Salty, not too sweet, with just the right texture, and not at all cakey (which is just the way I like them!). I only intended to eat half, but soon discovered that it was all gone, and I was entirely to blame–it was divine and worth every last calorie. That blondie was a hard act to follow, and I just couldn’t get into my Guinness Brownie with the same intensity, but it was still everything a brownie should be: again, not too sweet, thick, fudgy. A yin to the yang, so to speak, creating a lovely balance for my little meal. 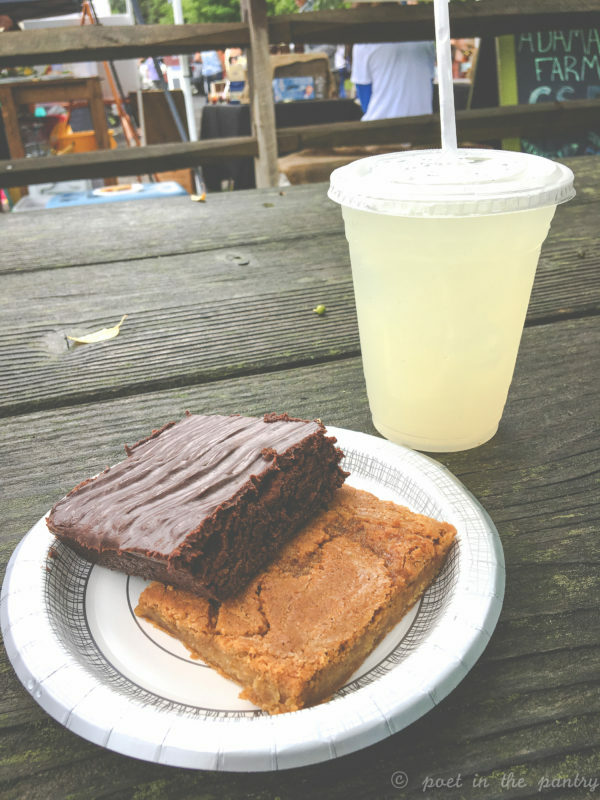 Some may think a lemonade is an odd pairing for baked goods, but those people would be wrong. I loved the inventiveness of the flavor combination, and the subtlety of the ginger in the lemonade–just enough, not at all overpowering. It makes the typical summer drink all the more interesting. 1. I noticed you have a blog on your website that pre-dates AmandaBakes. How did that come about? Do you miss blogging? I was looking for a way to catalog all my recipe testing. At home, cooking is not only my job but my hobby as well. I’d liken it to a writer who’s always thinking about his next verse. I am constantly thinking about flavor combinations, twists on recipes, and reading cookbooks. Blogging was a way for me to record all my tests, recipes I made on a whim, and to connect with an audience. To put that work out there in a meaningful way. I do miss having the time to write about and photograph food. Writing a cookbook is a project I have on the sidelines for the future. 2. 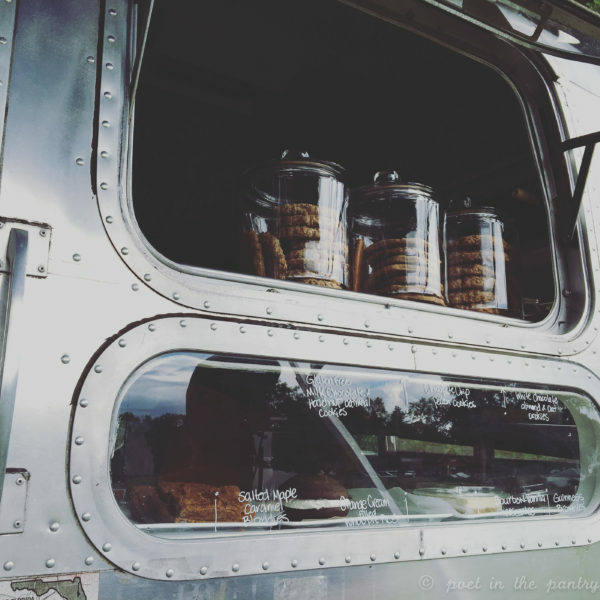 What made you take the leap to AmandaBakes and taking your goodies on the road? I was working nights as a baker for a busy bakery. The schedule was very convenient- and I could be home with my young kids during the day. The job itself was very fulfilling creatively speaking. Then there was a change in ownership and what followed was a rocky transition period. For me, baking is akin to a spiritual practice. If there are factors that are making me unhappy, the resulting product is unhappy. Well, one night I had just had enough. I gave my notice the next morning- with nothing lined up, and no idea where to look next. I scoured CraigsList for a job that day. There were lots of positions available, but the idea of applying for any of them depressed me. I was qualified enough to manage a restaurant or bakery, but my desire to be available to raise my kids and nurture my family life, cleared all but entry level jobs off my list. I decided then and there to go out on my own. I figured a food truck would be the way to go. I’d have flexibility to create my own schedule, and it would be affordable enough that I could avoid taking out major loans from the bank. So, I logged on to Ebay to see what I could find. And there she was! 3. 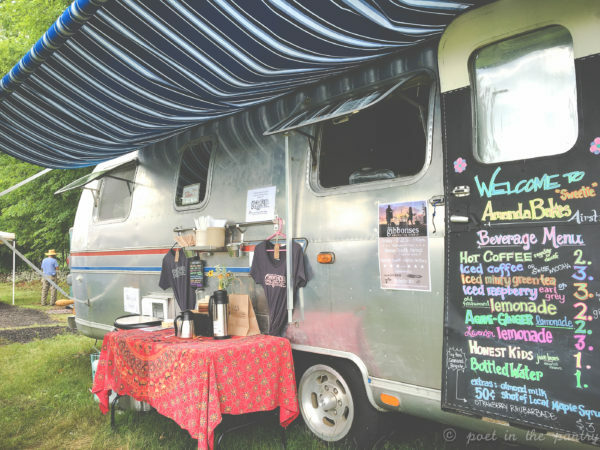 Why an Airstream? Where did it come from? I was looking for something unique. I didn’t want a box truck, that’s not my style. Well, there at the top of the page was an Airstream mobile bakery. First result. And it’s a 1978- the year I was born. I don’t get too excited though- this is Ebay. The thing could be located in Utah for all I know! Well, I scroll down and see that it is in Danbury. That’s it. It’s too perfect. The universe had spoken! I call my husband, and tell him that we are going down to Danbury ASAP to buy a mobile bakery. He’s so amazing and supportive. I quit my job in the morning and want to buy a mobile bakery by lunchtime, and he just rolls with it. Long story short- we buy it that weekend and tow it home with the help of a friend (we didn’t own a truck!). I empty my savings account. As it turned out, after limping my way through my first season at The Morris Marketplace- the trailer needed A LOT of work. I was blowing fuses every few minutes, its generator couldn’t handle the power load, windows and pipes were leaking, you’d have to do this dance of unplugging one thing to make another thing work. It was crazy! Last year, we brought it to Creative Mobile Systems in Manchester, CT and had a total systems overhaul. She runs like a dream now! Next big budget repair is getting the exterior polished up. 4. Working out of a food truck can be challenging. What’s your favorite part of the experience? It is challenging work! Sourcing the local products, then schlepping all the raw ingredients, preparing, setting up and breaking down, and maintenance is like another full time job. But, I see it as a great honor to be able to feed people. Its hard to explain the feeling of warmth and joy I get when I see people enjoying the food I’ve prepared for them. Every one of my customers is special to me and I love being able to connect with them through food. They are my community, and without them- where would I be? I love the market experience as well, the camaraderie and respect the vendors have for each other- it’s the way the whole world should be! I draw inspiration from many sources. Sometimes it’s the season, or an idea a customer has, or an idea I thought of while reading a favorite blog. Instagram also is a big influence on my creativity. My whole feed is pretty much food and great thoughts often arise as I scroll through in the morning. 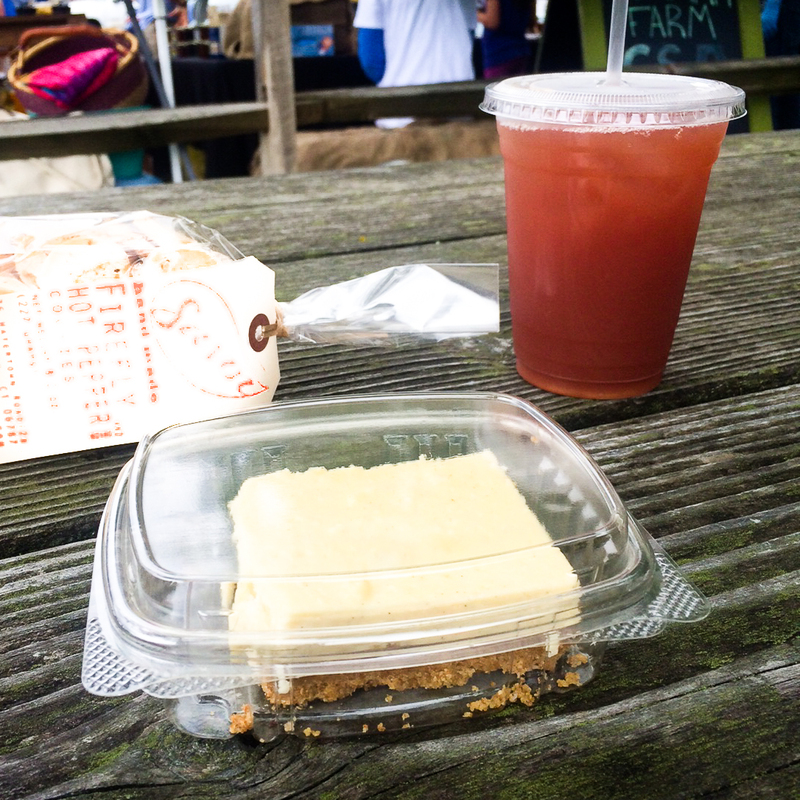 Some of my favorite blogs/IGers are Local Milk, Wholly Goodness, The Feed Feed, Smitten Kitchen, Connecticut Food & Farm. I should have grabbed a whoopie pie for the road, too! Ready to see what Amanda can bake up for you? 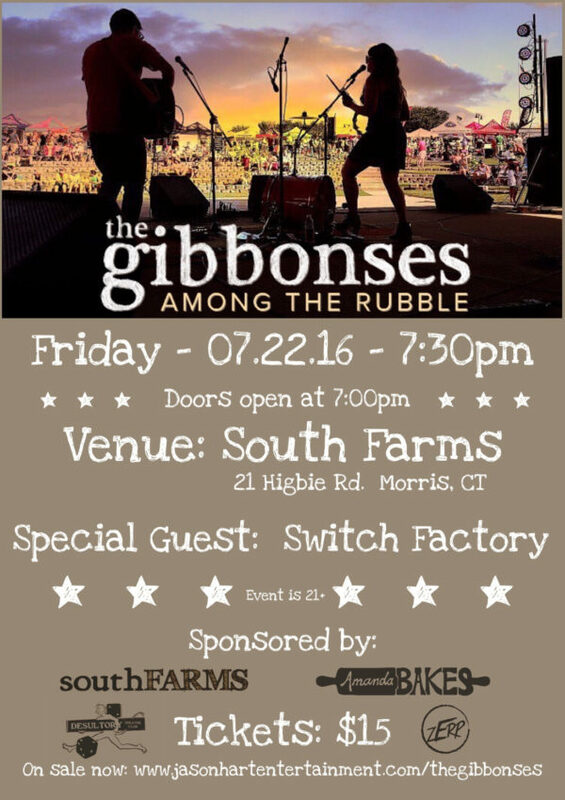 Tickets can be purchased at jasonhartentertainment.com. And don’t forget to bring some extra cash so you can eat your way through AmandaBakes’s menu, while you’re at it! Wow. Those treats look devine. I would definitely stop work to got and find this Airstream. 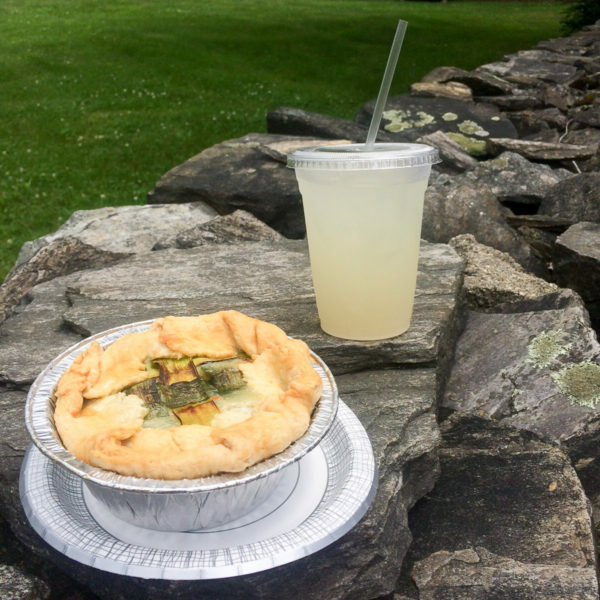 Bourbon chicken and leek pie? Wow, I want.